Persona 5: The Animation – funky anime adaptation; Megalo Box, hot blooded sports anime; one of a kind, Made in Abyss; Laid-Back Camp is comfy anime; Frame Arms Girls with tiny robot girls!. Plus, FREE Anime Episode; Free Manga; anime & manga reviews; hot Cosplay photos; and much more! many thabks for your great work. 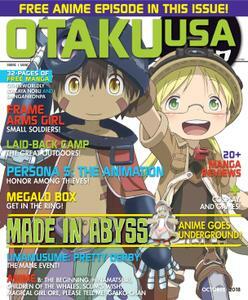 will you please upload more otaku usa issues?